Favorite Line: I'd wanted to stay on that porch with him until the sun shone bright on both of us, but I didn't. I stood up and walked down the steps. I'd rather chase the sun than wait for it. *Starred Review* Gr. 9-12. Ed is a 19-year-old loser only marginally connected to the world; he's the son that not even his mother loves. But his life begins to change after he acts heroically during a robbery. Perhaps it's the notoriety he receives that leads to his receiving playing cards in the mail. Ed instinctively understands that the scrawled words on the aces are clues to be followed, which lead him to people he will help (including some he'll have to hurt first). But as much as he changes those who come into his life, he changes himself more. Two particular elements will keep readers enthralled: the panoply of characters who stream in and out of the story, and the mystery of the person sending Ed on the life-altering missions. Concerning the former, Zusak succeeds brilliantly. Ed's voice is assured and unmistakeable, and other characters, although seen through Ed's eyes, are realistically and memorably evoked (readers will almost smell Ed's odoriferous dog when it ambles across the pages). As for the ending, however, Zusak is too clever by half. He offers too few nuts-and-bolts details before wrapping things up with an unexpected, somewhat unsatisfying recasting of the narrative. Happily, that doesn't diminish the life-affirming intricacies that come before. Like many people, I read Zusak's The Book Thief some time ago, and then bought this book because of how much I loved that one. Sadly, I read The Book Thief before starting my blog and so cannot direct you to what would have been a rave review on my part, but if you have not read this book yet, I strongly recommend purchasing a copy- in hardcover, if you can! It's amazing. I do not use that word lightly. I read it more than two years ago, and just thinking about it makes me tear up still. 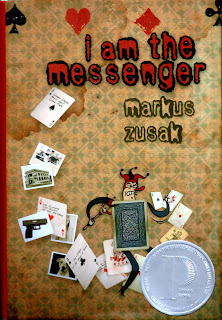 So, I purchased I am the Messenger after reading Zusak's later novel and started reading it right before my trip to New Zealand last year. I never finished it. I picked it up yesterday and basically started off from where my bookmark had been left over a year and a half ago. It wasn't very hard to get back into the story, though, and I think I was able to get back into it pretty well. But just so you know- this review is based on a very extended lapse of time between starting the book and finishing it. I really enjoyed this book, too. I love Zusak's writing style. It is very similar in both his books- when he has something important to say, he switches to short, succinct sentences to get his point across. He also makes beautiful pictures with his words. Really, I could have used any number of quotes in my "Favorite Line" section. Zusak knows how to turn a phrase. Ed, the main character, is an excellent narrator. He has a dry sense of humor and is a closet romantic- thus, we get moments of hilarity and others of sincerity. His friends, and the other characters that move in and out of the story, are also brought completely and brilliantly to life. As stated in the Booklist review above, the ending is very abrupt and leaves a lot to be desired. It didn't make much sense to me at all. However, that's probably not important, overall. The book itself is a messenger from Markus Zusak to you, challenging you to make your world better. Ed starts as a completely average person, barely participating in his own life, let alone anyone else's. Then, he's catalyzed into action. And suddenly, he's participating in everyone's life, not just his own. He spends the entirety of the book making other people's lives better. Sometimes in huge, life-altering ways, and sometimes in small but unforgettable ones, but in every instance, the recipient's life is improved and that person is truly, immeasurably grateful. How often have you received a random act of kindness? Possibly not often at all, but no matter how small the service, it always leaves you feeling as though the world is filled with wonderful people. This whole book is like that. It really makes you think about your own approach to life and how the things you do can genuinely affect the people around you. It's a great, thought-provoking read, and I think anyone reading it will be affected- at least for a little while- to practice random acts of kindness. I loved this book's message. My favorite passage was when Ed and Marv were painting the sidewalk. The message sounds very uplifting and reasonably well delivered. I still haven't read The Book Thief either. I'll have to rectify that, one of these days! Wonderful review! This one is on my TBR.